Compactness of representation simplifies many genetic operations. Fixed-length genome enforces upper bound on program size. This combined with other factors helps prevent program bloat. CGP has a form of redundancy involving inactive program nodes that have been shown to be very beneficial to evolutionary search. CGP for ECJ supports integer and real-valued representations for the genomes. The real-valued genomes allow us to use the new crossover operator that greatly enhances convergence performance for real-valued regression problems. This distribution contains everything you need to start building and running your own CGPs, and includes some sample regression, parity, and classification problems. To compile and run CGP for ECJ, you will need to use Java 1.5 or higher. A Cartesian Genetic Program is represented by a vector of integer values which encode the structure of an acyclic graph. The graph is associated with some number of input nodes, output nodes, and function nodes. Each function node of the graph represents a function that is given some number of inputs. Inputs for function nodes come from other function nodes, or from terminal (input) nodes. Each output node is directly connected to one of the function nodes. Figure 1: Example 3x4 integer genome representation.. The vector at the top is the genotype. The grid of numbered nodes is the phenotype. 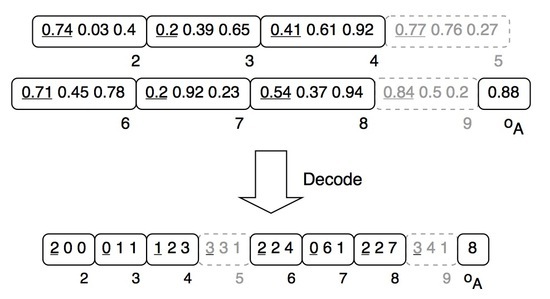 Figure 1 demonstrates the encoding of a sample integer vector. Inputs are numbered from 0 to 5. Outputs are labelled 13, 16, and 17. Each function node is shown as a numbered box with numbered inputs entering on the left and an output node showing the node number on the right. The number in the box indicates the function used by the function node. For example, "0" maybe used to represent "Addition", "1" to represent "Subtraction", and "2" to represent "Multiplication." Output 13 is evaluated by computing the value of function node 13, which evaluates function 1 on the inputs 9, 11, and 10. Each of these inputs is a function node which is also evaluated with its inputs. Evaluation continues in this way until terminal (input) nodes are reached. Grayed-out areas in the figure represent nodes that are inactive. These nodes are inactive because they are not connected to any output or any nodes involved in the evaluation of the outputs. Inactive nodes play a key role in evolutionary search because they help explore the search space as a result of normal genetic operations. Inactive nodes impose no additional computation burden until they become active by becoming connected to one of the paths from output nodes to terminal nodes. The CGP representational scheme enforces a feed-forward, acyclic network of function evaluations by constraining the range of values allowed for arguments of each function node. A function node's arguments must refer either to terminal (inputs) nodes, or to function nodes that are positioned to the left of the function node. CGP for ECJ uses a one-dimensional (single row) grid of function nodes. This convenient single row representation has been shown to be no less effective than the multi-row representation given in the CGP literature. Figure 2: Example one-row integer genotype and corresponding phenotype.. The vector at the top is the genotype. Below it is the phenotype, an evaluated program that implements the function x6 - 2x4 + x2. Inactive nodes are grayed out in both the genotype and phenotype. CGP for ECJ also supports real-valued encoding of the one-row genotype. 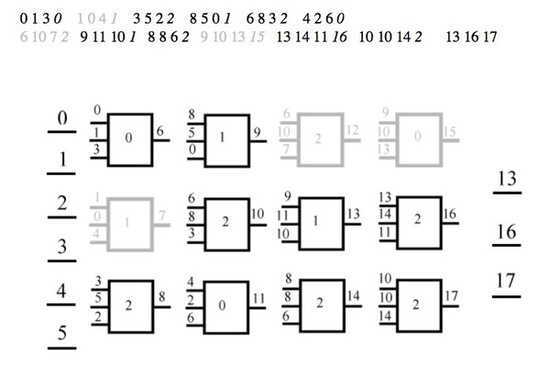 In this encoding, each position in the genotype is allowed to be a real value from the range [0, 1]. During the evaluation process, this real-valued encoding is converted to the integer-valued encoding described above. The motivation for this encoding is to introduce a real-valued crossover operator that improves convergence performance on certain evolutionary search problems. Prior work has found that traditional crossover operators have reduced the performance of evolutionary search in both CGP and GP. Thus, many experimenters choose to leave crossover operators out of their experiments. Clegg et al  found that their new real-valued crossover operator significantly improves performance for symbolic regression problems in CGP. These results are reproduced by the sample regression problems included in this CGP package for ECJ. However, I have not yet found similar improvements by using the same real-valued encoding and new crossover operator for the parity and classification problems included in this package. In fact, using the same approach for these problems is detrimental to their performance. Discovering improved genetic operators for these problems remains an open area of research. Figure 3: Example one-row real-valued genotype and corresponding mapping to integer-valued genotype.. This distribution contains all of the needed binaries, so you can run any of these scripts right away to test drive CGP for ECJ, provided that you have Java 1.5 or above in your path. ECJ version 18 is included as a jar file in the lib directory for your convenience. Please note that I have not tested CGP for ECJ against earlier versions of ECJ. Refer to the sample problems section for more information about the included sample problems. The sample parameter files implement two different algorithms. The first is a basic GA that uses tournament selection to select parents from a small population for breeding. New children are made using mutation. In the regression experiments using the real-valued representation, crossover is also used. The second algorithm is a mu+lambda evolutionary strategy which configures a single parent to breed four children using mutation at each generation. The best individual among the parent and children is kept in the next generation and the process is repeated. Customized extensions to the ES selection operator and Mu/Lambda breeder are used to exploit the neutral search that is beneficial to CGP. You must use the customized breeder ec.cgp.Breeder because it is responsible for computing the full expressions (phenotypes) that the integer-valued or real-valued vectors (genotypes) represent. The fitness class ec.cgp.FitnessCGP shown above is a simple fitness that makes smaller fitnesses better. This setting will depend on the problem you are running. You must use the customized breeder ec.cgp.MuLambdaBreederCGP for mu+lambda ES because it is responsible for computing the full expressions (phenotypes) that the integer-valued or real-valued vectors (genotypes) represent. The fitness class ec.cgp.FitnessCGP shown above is a simple fitness that makes smaller fitnesses better. This setting will depend on the problem you are running. We use the customized ES selection operator ec.cgp.ESSelectionCGP for CGP because, unlike the ESSelection class that comes with ECJ, ESSelectionCGP selects among equally high-fitness individuals with equal probability. This is important because CGP benefits greatly from neutrality of the evolutionary search. Mutations sometimes occur that change the genotype but do not affect the phenotype (and thus do not affect the fitness). These mutations are considered to have a neutral effect on the individual. The ESSelectionCGP operator takes advantage of these effects. The responsibilities of this class are to determine arity of each of your functions, compute results for each of your functions, generate descriptive display names for your functions, and generate descriptive display names for each of the inputs. Read the ec.cgp.functions.Functions API documentation for more details on the methods you need to implement in your implementing class. See the ec.cgp.functions package for examples of implementing classes used for the sample problems included in this distribution. Set up the input vector. This is a generic Object array. Your function set will receive the generic Object array and is responsible for performing any necessary type checking and conversions. If you are using constants, copy them from the constants array to the appropriate spots in the input vector. Pass the input vector to the ec.cgp.Evaluator.evaluate method to execute the CGP represented by the current individual's genome. The CGP is evaluated against the input vector, and a generic Object array is returned. Interpret the returned output of the CGP. Repeat the above steps for every input vector required to evaluate of the given individual. Compute a fitness value, and set the fitness of the individual. Set the individual's evaluated flag to true. The float representation parameter files are configured to use the new real-valued crossover operator implemented by ec.cgp.representation.FloatVectorIndividual.defaultCrossover. This operator is very good at reducing the number of generations required to find solutions to these regression problems. For more information on this crossover operator, see Clegg et al . Iris data set: This is a classic machine learning problem. The task is to classify the species of Iris flower given a set of four numerical measurements. Breast Cancer (Wisconsin) data set: This data set originates from Dr. Wolberg at the University of Wisconsin. The task is to classify tumors as "benign" or "malignant" based on nine numeric measurements. Breast Cancer (Yugoslavia) data set: This data set originates from Drs. Zwitter and Soklic at University Medical Centre, Institute of Oncology, Ljubljana, Yugoslavia. The task is to classify tumors as "no recurrence events" or "recurrence events" based on nine numeric and nominal measurements. The included classification problems are configured to partition each data set into a training (learning) set and a test (verification) set. The size of the test set is determined by the parameter problem.test, which indicates the proportion of the data set to reserve as the test (verification) set. If you do not specify problem.test, it will default to the value 0.3, which creates a test set out of 30% of the entire data set. Also, the default behavior of the included classification problems is to select test set items randomly from the entire data set. Each run will produce a different test set. In the included sample runs, the Iris and Breast Cancer (Wisconsin) data sets yield the best evolved classifiers. The evolved Iris classifier here has a 91% accuracy rate on its test set. A previous run not included here has a 95.6% test set accuracy. I have also seen a 100% accuracy rate on one of the test sets in a previous run, but the corresponding training accuracy was 92% and increased during the run, causing overfitting. The evolved Wisconsin breast cancer classifier included here has a 95% accuracy rate on its test set. A previous run not included here has a 96.2% test set accuracy. The evolved Yugoslavia breast cancer classifier included here has only a 78% test set accuracy, which is consistent with prior research which found classifier accuracies between 66% and 78%. You can find many papers related to CGP on Julian Miller's web site. J. Clegg, J. A. Walker and J. F. Miller, A New Crossover Technique for Cartesian Genetic Programming, Proceedings of the 2007 Genetic and Evolutionary Computation Conference (GECCO 2007), 2007. Julian F. Miller: What bloat? Cartesian Genetic Programming on boolean problems, 2001 Genetic and Evolutionary Computation Conference Late Breaking Papers, 2001. J. F. Miller and S. L. Smith, Redundancy and Computational Efficiency in Cartesian Genetic Programming, IEEE Transactions on Evolutionary Computation, Vol. 10, No. 2, pp. 167-174, 2006. Michalski,R.S., Mozetic,I., Hong,J., & Lavrac,N. (1986). The Multi-Purpose Incremental Learning System AQ15 and its Testing Application to Three Medical Domains. In Proceedings of the Fifth National Conference on Artificial Intelligence, 1041-1045, Philadelphia, PA: Morgan Kaufmann. Clark,P. & Niblett,T. (1987). Induction in Noisy Domains. In Progress in Machine Learning (from the Proceedings of the 2nd European Working Session on Learning), 11-30, Bled, Yugoslavia: Sigma Press. Tan, M., & Eshelman, L. (1988). Using weighted networks to represent classification knowledge in noisy domains. Proceedings of the Fifth International Conference on Machine Learning, 121-134, Ann Arbor, MI. Koza, J.R. (1992), Genetic Programming: On the Programming of Computers by Means of Natural Selection, MIT Press; Koza, J.R. (1994).